I love Philadelphia, but in many ways it is a city of contrasts. It is a big city (the fifth largest in the country), but has a small town feel to it. The people of the Philadelphia are certainly a proud bunch, but we seem to readily accept the role of red-headed step child on the I-95 corridor: New York, Washington D.C., and even Boston are seen by many as the “major” cities on the East Coast. There are some of the most passionate sports fans on the planet in this region, but rarely is there a team (in any sport) that can match the collective will and determination of the fan base. Then there is wine. Philly is a phenomenal food town, with incredible restaurants and a rich tradition of immigrant influence on the local cuisine. In most cities with such a rich food culture, one would also find a similar appreciation for wine. Thanks in large part to the Pennsylvania Liquor Control Board (the PLCB), any burgeoning wine culture is quickly snuffed out by the antiquated stores, the dispassionate employees, and the draconian laws. But this is not another PLCB bashing article, as it seems as though the tide might be slowly shifting in my City of Occasional Brotherly Luke Warm Affection (and sometimes Disdain). The PLCB does not seem to be going anywhere anytime soon (sadly), but more wineries and distributors are recognizing the potential for quality wine sales here at the confluence of the Delaware and Schuylkill Rivers. Over the last several months, I had a winemaker from Washington co-host a wine dinner with me, and I have attended a few trade tastings. One of those happened back in September when I had lunch with Germán di Césare, the winemaker at Argentinian super-producer Trivento. Concho y Toro, the Chilean brand that is the largest producer of wine in South America, purchased a collection of vineyards on the other side of the Andes in the mid-1990s, and started Trivento, now the third largest exporter in Argentina. I have to admit that I normally eschew larger producers in general, and know next to nothing about South American wine, but when the wonderful Jane Kettlewell of Creative Palate Communications set up the meeting, there was no way I could refuse. And I am glad I didn’t. He also sports a full beard, that looks like it takes little effort to grow. I did not hold that aginst him. From right to left: Jason Cohen of PA Vine Co., Germán di Césare, Jane Kettlewell, and me. Clearly Jane and Jason did not get the memo to wear something colorful with stripes. We tasted through five wines that afternoon at Estia Restaurant on Locust Street, starting with Trivento’s flagship white. (I have been to four trade tastings in Philadelphia and three of them were held at Estia, even though it is a Greek restaurant and none of the tastings were Greek wines. Go figure. It is a fine spot, though, and the food has always been outstanding). 2014 Trivento Torrontés Reserve Mendoza: Retail $10. Torrontés as a variety is about a century old, a cross between two grapes: Mission and Muscat of Alexandria, and has become the quintessential Argentine white. Floral, melon and lemon notes on the nose, and very nice on the palate: Bright and vibrant. At $10? You bet: this is an absolute steal. Sure, they make a boatload of it, but that just means it will be easy to find. Do yourself a favor, try this (if you have not already). Very Good. 88-90 Points. Next up was the Amado Sur, a relatively new line for Trivento that is a blend of three grapes, made in a more approachable, fruity style. 2014 Amado Sur Malbec: Retail $15. 40% French oak, 10% of which is new. 70% Malbec, 20% Bonarda, and 10% Syrah. In a 2013 bottle but actually 2014. Meant as a “gateway wine” as it is not too big, not too reflexive, and ready to drink. Fruity and approachable, with good acidity and rich red berry flavors. Can go well with octopus (which is what I ordered) or a big juicy burger. Quite a versatile wine. Very Good. 87-89 Points. We then moved on to a mini-vertical of Golden Reserve Malbecs. For a wine geek like me, it is always a treat to taste a few wines with just one different characteristic (in this case vintage) side by side. It gives you a chance to see if you can pick out the subtle differences between the wines (or at least hone your lying skills when you can find no tangible difference). Most of the important Malbecs, according to Germán, are planted in Lujan de Cuyo, and the Golden Reserve comes from four vineyards there that are 60-100 years old, making them the oldest Malbec vines in Argentina. From left to right (or from right to left-how are you going to tell the difference? 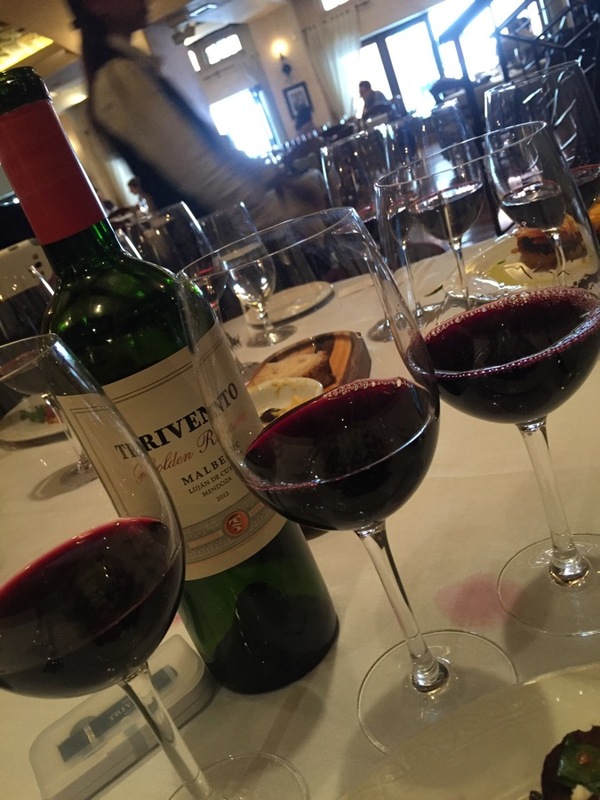 ): the 2011, 2012, and 2013 Trivento golden Reserve Malbec. 2011 Trivento Golden Reserve Malbec Luján de Cuyo: Dark fruit but light on its feet. 40% new oak. 30% one use. 30% two use (that means some of the oak barrels were used, imparting less oakiness than had they all been new). Great nose. Wow. A bit of mocha on the backend. This is impressive now but has some life left. If you can find it, buy it. Outstanding. 90-92 Points. My calamari salad, which paired well with all the wines. 2012 Trivento Golden Reserve Malbec Luján de Cuyo: More austere than the 2011, but this is my wheelhouse. Shy and understated but whoa. This I would buy a ton of. Really. Drink some now, and save the rest for 5, 10, or even 15 years. Yeah, that’s my plan. Outstanding. 92-94 Points. 2013 Trivento Golden Reserve Malbec Luján de Cuyo: This was a tough one as it followed the 2012. This is clearly more fruit driven and ready for consumption now. Sure it could improve a bit over the next few years, but why wait? Drink this now and be really happy as you are waiting for that case of 2012 to get a bit older. Think of this as a prom date–a lot of fun and reason to get all dressed up, but not one that you will still be in touch with five years from now. Very Good to Outstanding. 88-90 Points. Perhaps what is most remarkable or even crazy about these wines is the price: they all retail at around $20. Or $25 if you are buying in Philadelphia. This entry was posted in Malbec, Torrontés, Wine, Wine Tasting. Bookmark the permalink.